We consider wall-crossing phenomena associated to the counting of D2-branes attached to D4-branes wrapping lagrangian cycles in Calabi-Yau manifolds, both from M-theory and matrix model perspective. Firstly, from M-theory viewpoint, we review that open BPS generating functions in various chambers are given by a restriction of the modulus square of the open topological string partition functions. Secondly, we show that these BPS generating functions can be identified with integrands of matrix models, which naturally arise in the free fermion formulation of corresponding crystal models. A parameter specifying a choice of an open BPS chamber has a natural, geometric interpretation in the crystal model. These results extend previously known relations between open topological string amplitudes and matrix models to include chamber dependence. On leave from University of Amsterdam and Soltan Institute for Nuclear Studies Poland. R. Gopakumar and C. Vafa, M-theory and topological strings. I, hep-th/9809187 [SPIRES]. R. Gopakumar and C. Vafa, M-theory and topological strings. II, hep-th/9812127 [SPIRES]. F. Denef and G.W. Moore, Split states, entropy enigmas, holes and halos, hep-th/0702146 [SPIRES]. M. Kontsevich and Y. Soibelman, Stability structures, motivic Donaldson-Thomas invariants and cluster transformations, arXiv:0811.2435. D.L. Jafferis and G.W. Moore, Wall crossing in local Calabi Yau manifolds, arXiv:0810.4909 [SPIRES]. B. Young and J . Bryan, Generating functions for colored 3D Young diagrams and the Donaldson-Thomas invariants of orbifolds, arXiv:0802.3948 [SPIRES]. K. Nagao and H. Nakajima, Counting invariant of perverse coherent sheaves and its wall-crossing, arXiv:0809.2992 [SPIRES]. K. Nagao, Derived categories of small toric Calabi-Yau 3-folds and counting invariants, arXiv:0809.2994. K. Nagao, Non-commutative Donaldson-Thomas theory and vertex operators, arXiv:0910.5477 [SPIRES]. M. Aganagic, H. Ooguri, C. Vafa and M. Yamazaki, W all Crossing and M-theory, arXiv:0908.1194 [SPIRES]. B. Eynard and N. Orantin, Invariants of algebraic curves and topological expansion, math-ph/0702045 [SPIRES]. H. Ooguri, P. Sulkowski and M. Yamazaki, Wall Crossing As Seen By Matrix Models, arXiv:1005.1293 [SPIRES]. B. Eynard, A Matrix model for plane partitions and TASEP, J. Stat. Mech. (2009) P 10011 [arXiv:0905.0535] [SPIRES]. P. Sulkowski, Refined matrix models from BPS counting, arXiv:1012.3228 [SPIRES]. M. Aganagic and K. Schaeffer, Wall Crossing, Quivers and Crystals, arXiv:1006.2113 [SPIRES]. R.J. Szabo and M. Tierz, Matrix models and stochastic growth in Donaldson-Thomas theory, arXiv:1005.5643 [SPIRES]. K. Nagao, Refined open non-commutative Donaldson-Thomas invariants for small crepant resolutions, arXiv:0907.3784 [SPIRES]. K. Nagao and M. Yamazaki, The Non-commutative Topological Vertex and Wall Crossing Phenomena, arXiv:0910.5479 [SPIRES]. S. Cecotti and C. Vafa, BPS Wall Crossing and Topological Strings, arXiv:0910.2615 [SPIRES]. 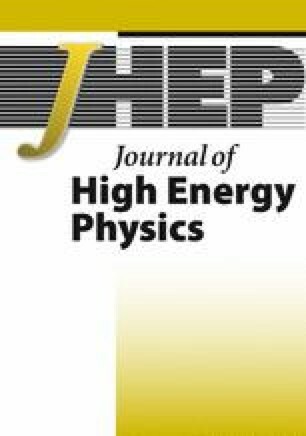 N. Saulina and C. Vafa, D-branes as defects in the Calabi-Yau crystal, hep-th/0404246 [SPIRES]. P. Sulkowski, Calabi-Yau crystals in topological string theory, arXiv:0712.2173 [SPIRES]. R. Dijkgraaf, C. Vafa and E. Verlinde, M-theory and a topological string duality, hep-th/0602087 [SPIRES]. M. Aganagic and C. Vafa, Mirror symmetry, D-branes and counting holomorphic discs, hep-th/0012041 [SPIRES]. M. Mariño and C. Vafa, Framed knots at large-N, hep-th/0108064 [SPIRES].